August has been a rough month all around. The tannin-stained water that we’ve had since Tropical Storm Debby visited has not yet cleared, we’ve had lots of rain since then, and many days of west winds have blown in massive quantities of floating grass which has made inshore fishing a true challenge. The biggest impact has been on scalloping, which is one of the great attractions to our area. The scallops are present, but it’s been very difficult to find them in water that has, at times, had a visibility of less than a foot. Long runs north to areas closer to Keaton Beach, and south to the Pepperfish Keys, have provided some limits, but the stained water has made it challenging even ten miles away from the Steinhatchee River because of the many creeks draining our beautiful marshes, and the continued rain. I fished several weekends this month in close to shore with varying success. I did manage to find three redfish near structure, using popping cork rigs with Gulp shrimp. We also managed a few trout on soft jerk baits rigged for weedless use, but our usual topwater bite was unavailable because of the grass. However, things are picking up. This past weekend Capt. TommyThompson and I fished near Big Grass Island on a low morning tide and found the water to be definitely clearing. 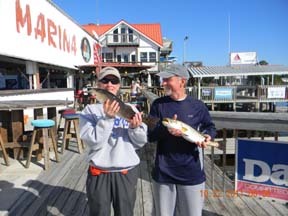 We were able to fish topwaters on the low tide and managed several trout, with water visibility of several feet. Unfortunately, as the tide came in, it brought with it more stained water and large mats of grass, but we’re convinced that things are beginning to look up, especially if we avoid any more storms. Offshore fishing has been challenging as well, with lots of afternoon thunderstorms and water spouts making everyone a bit nervous. The stained water was seen as far offshore as 25 miles or more. 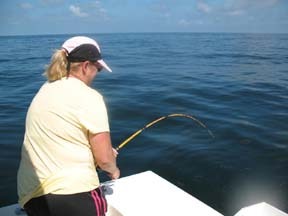 The grouper bite was inconsistent, even in 50 to 80 feet of water. 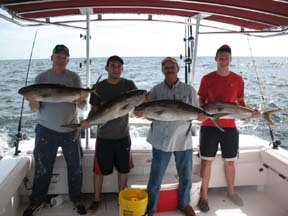 Amberjack were available as were Florida snapper for those that were willing to dodge the storms, but again near the end of the month things improved. Capt. 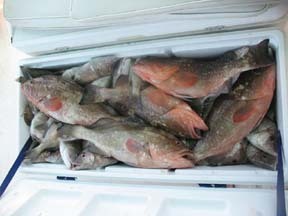 Steve Hart got 5 grouper on Saturday on the last weekend of the month, fishing in the relatively shallow 40 foot depths. Check his report for rigging hints at this time of year. The best thing about this time of year in terms of fishing, is that the fall is coming with cooler temperatures and fewer thunderstorms. The fishing forecast for September will obviously depend on the tropical picture somewhat, but we expect the fishing to improve dramatically as the water clears. By the end of the month we should be back in the saddle with excellent inshore and offshore fishing, and scallop season remains open so with clearing water you should be able to locate some of those as the water clears. Both red and gag grouper will be open until October, and with better temperatures and more stable weather, the offshore picture is bright. 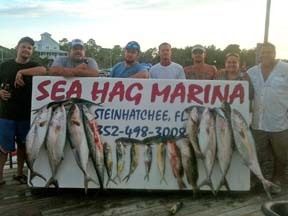 While trolling may work in clearer waters, most captains will be using dead or live bait and bottom fishing. 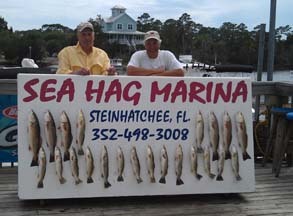 Inshore fishing will likewise be weather dependent, but fall fishing in Steinhatchee is excellent. Redfish will begin to school and these fish will be largest inshore fish of the year as those bull reds nearing 30 inches in length will begin to school in preparation for leaving their inshore habitat for the last time to spawn and live the remainder of their lives offshore (and occasionally getting in the way of offshore grouper fishermen). 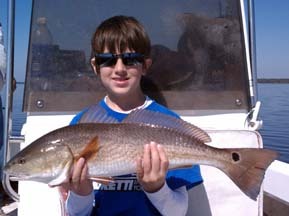 When the grass clears out of the area, topwaters, crank baits and suspending plugs should score well with redfish near inshore structure, as will cut bait fished near oyster bars and rock piles, especially later in the month, but be on the lookout for schools of fish and fish them carefully as quietly as possible. Trout will hopefully move onto the grass flats in good numbers, but while the water is still dark, fish in 5 to 10 feet of water with jigs and Gulp baits or cut bait near the bottom. On the flats, popping cork rigs with Gulp or DOA shrimp will score well. The Sea Hag Ship’s store has recently restocked their Gulp baits and has a wide selection of excellent plugs and soft baits, popping cork rigs and terminal tackle to get you some excellent fishing in our area. August was a tough month with all the rain and hurricanes. The scallop season started out good but the water now is red and cloudy. The only sure way to find them now is to walk around and step on them. Looking on the bright side, this should make next season great since the majority of the scallops will actually be able to spawn this season. Fishing is ok to good. You really have to work at catching right now. The water clarity is making the bite tough. Even when you get lucky enough to find clear water, the trout are very slow to bite and the redfish slower. With September rolling in the bite should start improving now with water temps slowly cooling. Take a close look at the photo of me with my trout from last week. He’s not a whopper, but just look what’s in his mouth! It’s a topwater plug (a Heddon Super Spook Jr.). The floating grass we topwater anglers have been fighting seems to be drifting off to Mexico with some easterly breezes and stronger falling tides. Of course, the grass is still there, in some cases in the form of huge mats that block creek mouths. But if you can find a spot, usually on low water, where the grass isn’t, you’ll likely find hungry trout and reds all along our Taylor and Dixie county shorelines. And now that the water’s clearing up a bit (again on low water), look for potholes where both trout and reds can hide and set up ambushes of small bait–and your lures! I recommend you fish for trout and reds early and then scallop as the sun comes up. Scallops are more likely to move to the top of the grass as the day brightens. That’s when they’re easier to see, too. Also, try to plan your scallop expedition a couple of hours before and after the low tide. Snorkeling or wading is much easier then. 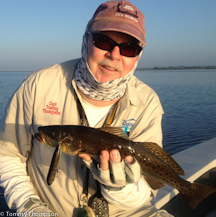 If you’re interested in some more in-depth information about fishing Florida’s Big Bend, take a look at my weekly Fishing4Cast on the Florida Sportsman Magazine Web site at http://www.floridasportsman.com/4cast/bb, the Florida Sportsman Big Bend Action Spotter column in each month’s issue. All of the Big Bend fishing 4Casts are now available to to viewed on my editorial website. And starting this month, I’ll be taking over the ‘Sportsman’s Kitchen’ column in Florida Sportsman magazine. I like to fish, but cooking and eating are a close second-place! Well, August is gone with all the rain and hot weather; maybe September will be a little dryer and things will start to cool off. As for fishing, the grouper bite has been a hit or miss. Some trips to deep water in the 80′ plus range have worked well but I have also had some days when you could have a decent catch in the 48′ to 55′ range. I have not focused on live bait but have been using mainly frozen herring and cut bait. I usually mix it up with half the party using lighter equipment for Florida Snapper and half on grouper rods. 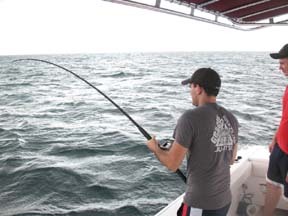 This tactic works well for me, it keeps action going and that stirs up activity and will sometimes help the grouper bite and at the same time you are always putting good fish in the boat. When fishing for Florida snapper and sea bass I use something light like a Penn 209 with a 30′ lb line, 2/0 hook and 4 oz sinker and either cut bait or squid. I always keep an extra heavy rod handy just in case a cobia comes by. 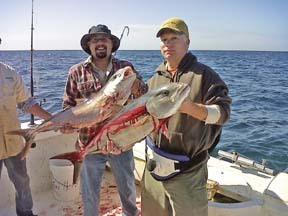 Amberjack have been hit or miss but still worth giving a try with a jig, or a large top water popper, and always have some live bait if you can get it. I always look forward to cooler weather as the bite is always better. Remember that gags will be open until the end of October but red grouper will remain open with the limit at 4 per person. So be safe out there and give us a call and I hope to see you on the water soon. If you like shark fishing now is the time to travel offshore and tussle with as many 4 footers as you care to tussle against. In 70 foot of water, the sharks that were pupped out on the flats in April and May have now grown and moved out. I’m not talking happenstance catching, but seeing two-dozen sharks buzz around the boat and sight casting to them. Start by bottom fishing around big structure to bring them up, then switch to free-lining heavy spin tackle, with any bait, with a trace of #7-9 wire leader to the hook. It is a great time to hone your skills and enjoy the sport of fishing. A buzzing reel drag is a hoot regardless of what is making it sound that way. Honestly, shark meat, from 3-4 footers, cubed in 1 inch pieces and fried is delicious. You’re allowed two sharks per vessel. Obviously, be careful handling them, they bite! Grouper fishing has been tough. The best bet is to use cut bait and scale down the chunks to collect some super-sized Florida snapper yet be tackle ready for the occasional grouper. There is tons of live bait swimming the hard grouper bottom, so the intermittent grouper bite is a blessing amongst millions of opportunities for their next meal. 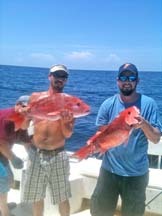 Additionally, the Florida snapper we’re catching right now are running large, in the 2lb.range. Amberjack of legal size have vacated waters inside of 32 nm. Smaller AJ’s will run your line out, but have to be tossed back. If the big amberjack aren’t present, don’t think it isn’t worth a swing-by, because a cruiser cobia might find your bait and fulfill one item off your bucket-list. Every day you get to go fishing is worth the cake; the fish are the icing. One must adapt to the current situation and not foolishly focus on solely what you want. It is better to roll with what Mother Nature offers than beat your head against the natural flow. Geoffrey Norman said it well, “No fisherman ever fishes as much as he wants to”……………………….Go for it!